This is a hike that 12 of us took on a beautiful August day. Everyone went but Marina. 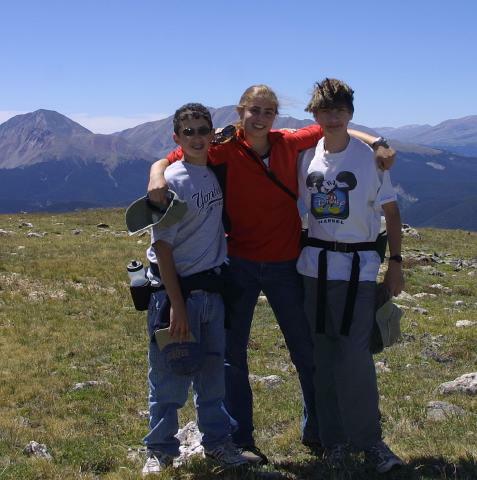 So to make up for her not coming, Marina and I hiked to Independence Peak 2 days later. 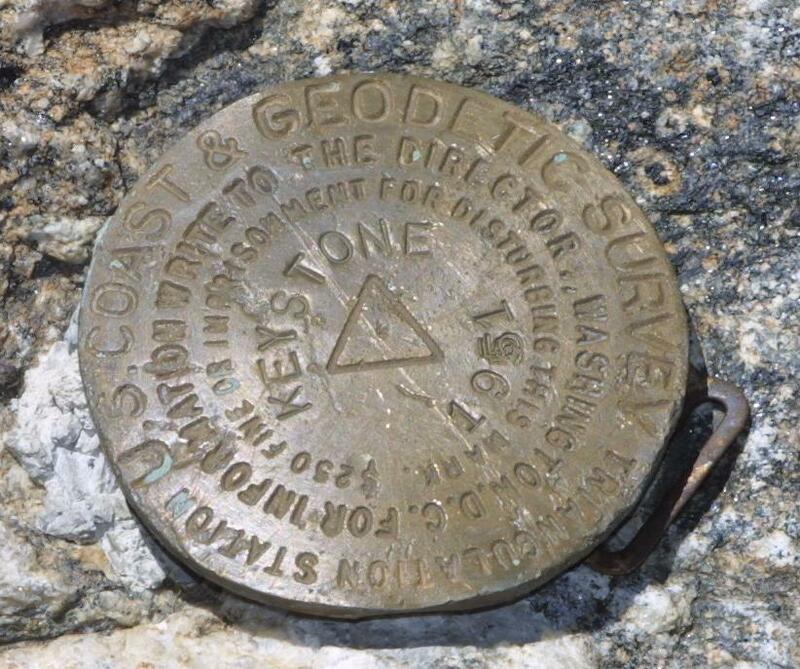 To save some elevation gain, we took the Keystone Gondola to the top and started from there. We had intended to repeat the Erickson Mine hike in which we took the 2nd Gondola to North Peak, but that Gondola was closed until the evening. Clicking on this map will bring up a full map with profile, suitable for printing on a single 8.5 by 11 inch page. 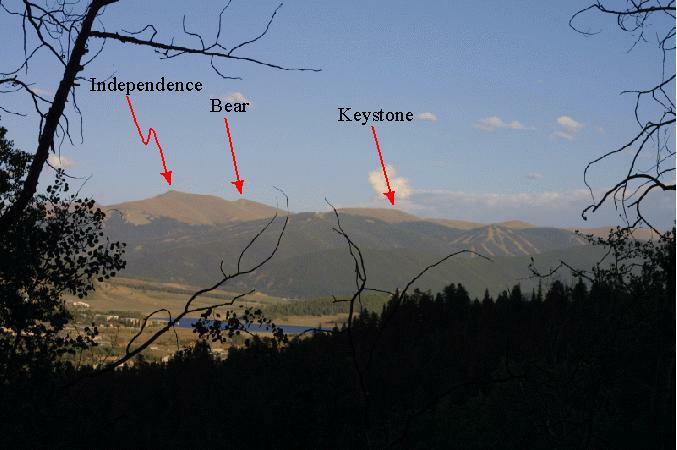 I also have a picture of the various peaks (Keystone, Bear and Independence) taken from the Ranch at a distance of 11 miles. 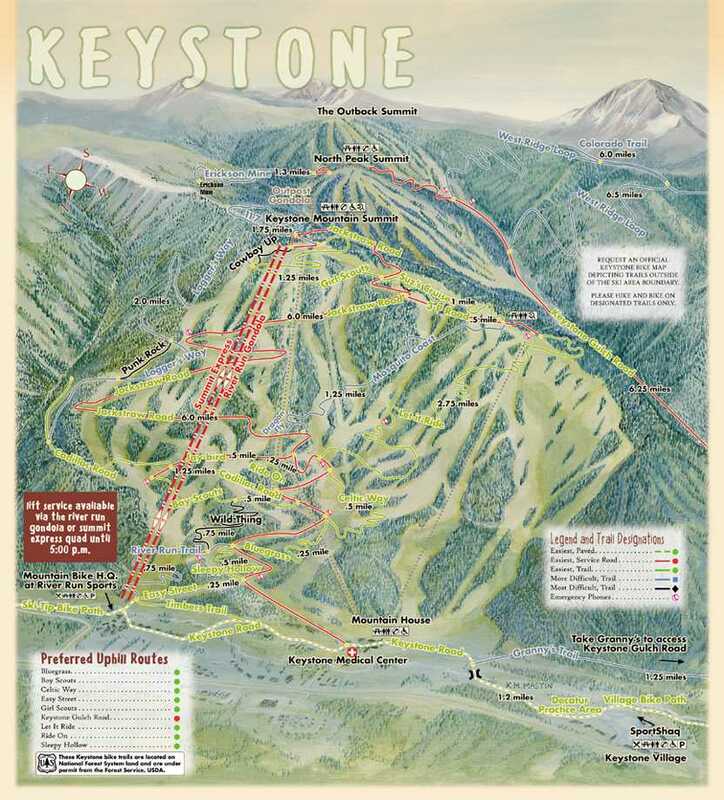 I have copied the summer mountain bike map from Keystone and posted it on my web site here. 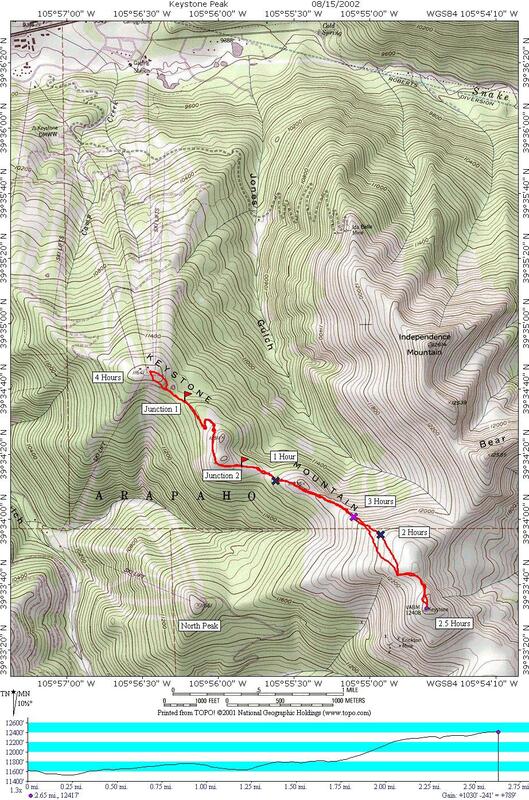 If you look at this map, from the summit going to the left in a yeechy shade of blue is a trail marked 11:7 (I thought it was the 7:11 not 11:7 trail). We started our hike on this trail. 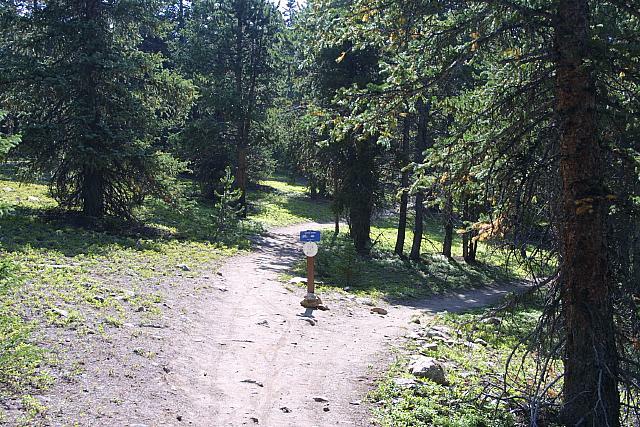 The bike trail is in fact a loop, and you quickly come upon a junction, labeled "Junction 1" on the topo map. 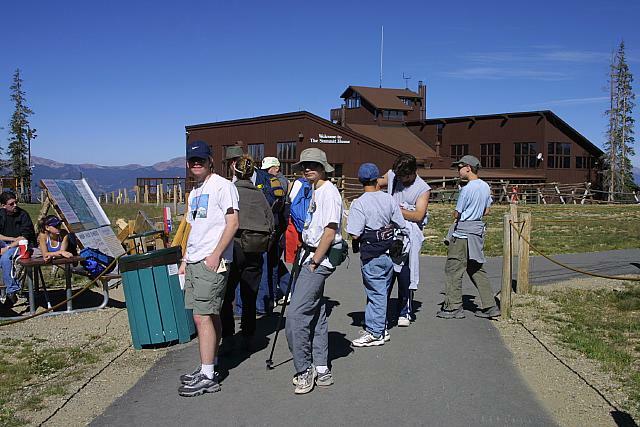 In reality as you leave the trail here, after hiking through the meadow (following the red in the picture), you will see the trail recover. 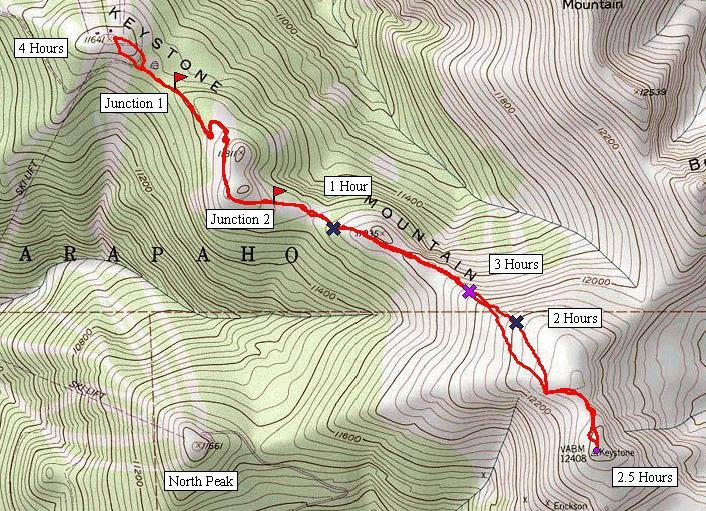 The in the picture, the peak just to the left of the red trail is Bear, and to the right, partially shaded by the trees is Keystone where we are heading. This junction is at approximately 1 mile from the gondola. There are no markers per se, but there is a couple of surveyor's tape pieces hanging from tree branches. (The above picture was actually taken on the Independence hike two days later, and we had a ton of smoke from the Steamboat fires in the air, so visibility was poor and the sky was not blue). 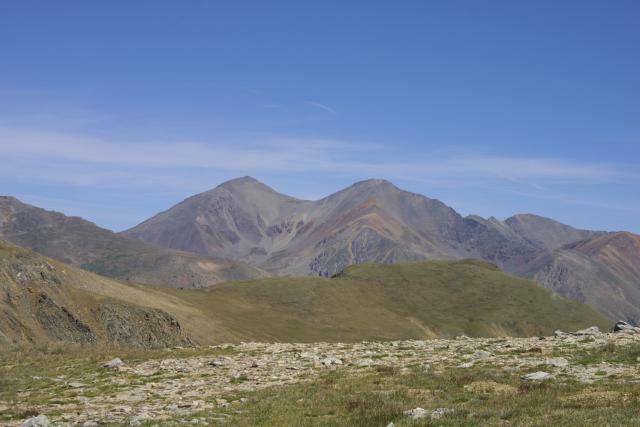 A short walk quickly brings you to tree line, and a sharp drop off to Jones Gulch on your left. 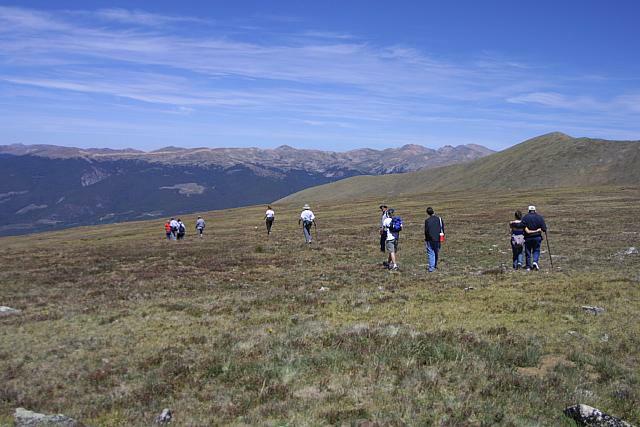 Ahead the trail again disappears, but what you are left with is a climb through alpine meadow to the peak. I stayed close to the edge of the drop off into the gulch as I made the climb. The group starting back down. As you can see it is just an alpine meadow. This looks back towards where you re-enter tree line. Finally, a couple of "stitched" pictures. 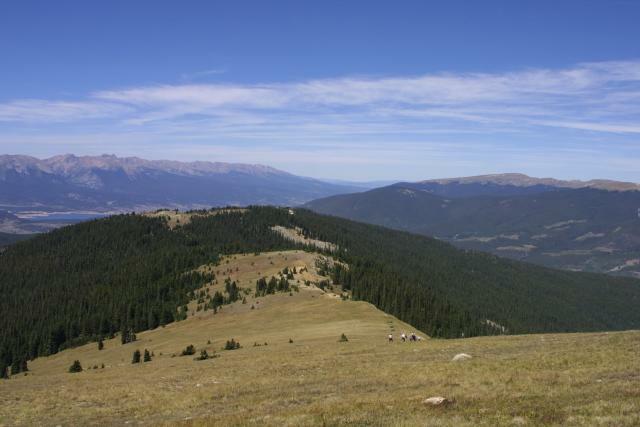 The ski area in the distance is Breckenridge. This one looks back towards Buffalo (more or less in the center of the picture.